Sanex Zero% shower gel has fewer chemical ingredients and a mild, biodegradable formulation containing moisturisers of 100% natural origin. 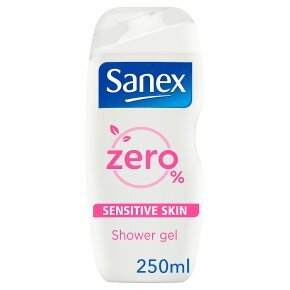 Sanex Zero% for Sensitive Skin contains the ingredients needed for a clean and moisturised skin, helping to keep your skin healthy whilst respecting the environment. Sensitive to skin. Dermatologically tested. 0% fragrance, 0% parabens, 0% colorants, 0% soap. European Ecolabel, Nordics Ecolabel, Danish Astma and Allergy Association certified. Even the most sensitive skin is protected with dermatologically tested Sanex Zero% Sensitive Skin Shower Gel. Containing 0% parabens, 0% colorants and 0% soap, the fragrance free formula guarantees no fragrance allergens. Its biodegradable formula respects your sensitive skin and the environment.